This is something fun that you can make for your child but it's even better if they can get involved too. Decorating the guitar by painting or gluing on scraps of paper makes it look great and perfect for any budding pop stars. It might not make a tune but is great to use alongside your kids favourite CD. Scraps of paper and anything else to decorate or paint. 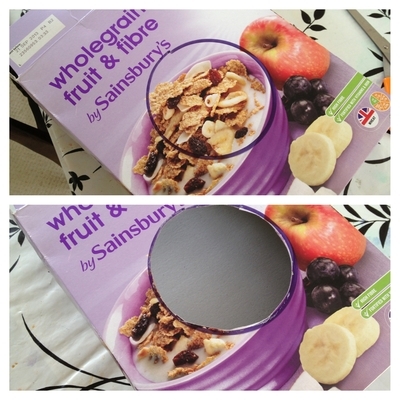 Use a small bowl to draw a circle template in the centre of the box. Cover the box in glue and stick on scraps of paper or paint to decorate it. Use the end of the cardboard tube as a template and draw a circle in the centre of the flap end of the box and then cut it out. Insert the cardboard tube through the hole and then slip your hand inside the circle on the front to stick down inside with some sticky tape. I also used some blu tack to hold the tube in place for this part. Cut a few short slits at the top of the cardboard tube and some long lengths of string. Insert one end of a piece of string through the slit to hold it in place. Repeat with a few more pieces of string. Tape over the string and the slits to hold firmly in place. Pull all the strings tight and straight, wrap over the bottom of the guitar and tape down firmly. I used several pieces of tape as my toddler is very enthusiastic when it comes to playing with toys. The toy guitar is now ready to play with. Put on some great music, play the guitar and sing along. You could even get pots, pans and a couple of wooden spoons out and start a band if you have more kids. Music and make believe are wonderful activities for kids of all ages. The benefits of music start from birth and there are so many ways you can introduce kids to the delights.